STORIES ♦ Who is Buddha anyway? More than 90% of people in Thailand are Buddhists, and if I was going to be in their presence and visit their temples, I needed to learn more about who Buddha was and what Buddhism means. A small disclaimer: I don’t claim to be a historian or an expert – this is what I learned, in my own words. Don’t judge me. So here’s the story, as I understand it. A couple thousand years ago, there was a prince in Nepal by the name of Siddhārtha Gautama. He was born with the proverbial silver spoon in his mouth, and lived the affluent and sheltered life of a royal. When he was in his twenties, he ventured out into the world and was shocked to encounter suffering, sickness, poverty, and death. Rather than run screaming back into the sanctuary of his cushy life, he set out to change things and find the secret to true happiness. Taking things to extremes (as people in their twenties will do), he forced himself to live in bleak conditions, starving himself in the process. After several years of this, he realized that deprivation didn’t provide happiness any more than wealth and luxury had. As the story goes, it was then that Sid decided to sit under a tree (the famous “bodhi tree” I wrote about in a previous post) until enlightenment was revealed to him. To conclude, Buddhism is not a religion that worships Buddha as a god or deity, but is a way of life. So let’s talk about all those magnificent temples and golden statues. The ceremony in going to a temple and kneeling to a Buddha statue is not to worship or to ask for favors, but to express gratitude for his invaluable teachings, and to pray to live a life of positivity and peace. Buddha likenesses have varied in appearance throughout the centuries. In a previous post, I told you about the colossal Reclining Buddha at Wat Pho in Bangkok. Wat Pho is also renowned for having almost four hundred ancient Buddha images, of different styles and periods, from various regions of Thailand. There are golden statues standing in rows, and others sitting in the traditional lotus position, hands resting gently in their laps, compassionate smiles on their faces. You can also buy your own Buddha likeness. There are countless statues of every shape and size sold in stores all over Thailand. In some temples, there are statues and realistic likenesses of esteemed Buddhist monks. These are wax figures in a temple that I visited in Chiang Mai. 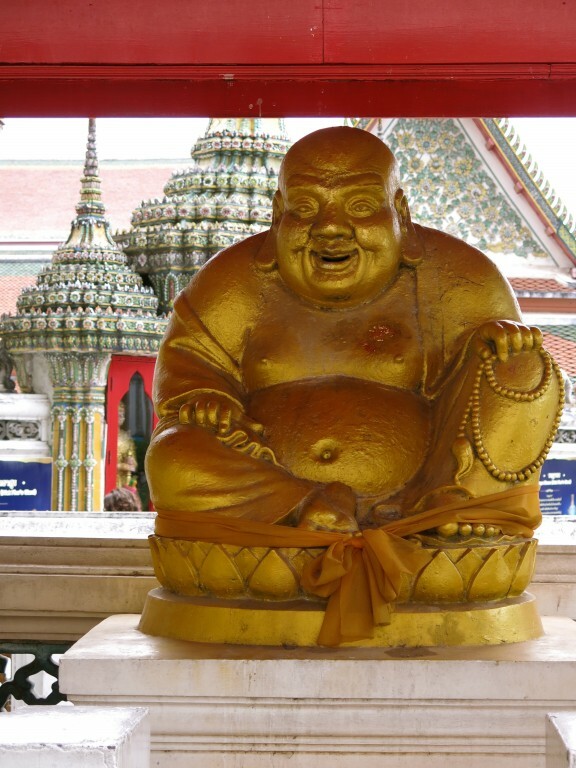 There are several rituals in Thailand that go along with praying for guidance from Buddha. The supplies are typically for sale at the entrance to the temple. Three incense sticks are lit, one for Buddha, one for Sangha (the Buddhist community), and one for Dharma (the teachings of Buddha.) A small candle is also sometimes lit, to signify enlightenment. A lotus flower symbolizes the purity of Buddha’s teachings. Gold leaf is placed onto the Buddha statue, in the form of a small square adhered with a fingertip, to honor the illuminating doctrines. Garlands of colorful flowers are also offered to the statues, to symbolize the beauty of Buddha’s beliefs. Throughout Bangkok, there are people making and selling all manner of floral festoons to take to Buddha. While I was in Thailand I stumbled across a couple of other unique Buddhist traditions. One was outside a temple in Chiang Mai – the one with the wax monk figures. I saw a table covered in a yellow plastic tablecloth, and some shiny items in a box. I was with a guide, who instructed me to put 39 baht (about $1) in a metal box, and then take a little gold embossed rectangle out of the plastic bin on the table. Then I used a pen to press my name, birthdate, and Chinese zodiac sign into the metal. The guide studied the carvings on the temple wall to determine that my sign was the Dog. I slipped the gold page into a slot in a plexiglass box, where the monks will collect it and say prayers for me. Wherever I am in the world I like to participate in religious and cultural traditions, to better learn about the people. That said, I’ve never been one for seeking out psychic predictions of the future…until I stepped into a tiny temple in a bustling night market in Bangkok and learned about this Buddhist custom. The temple was a small alcove, filled with a massive statue of celebrated eighteenth century monk, Somdej Phra Buddhacara Toh Phramarangsi, aka, Somdej Toh. He was surrounded by the typical offerings of incense and flower garlands. After you pay your respects to the Buddha icon, you pick up the cup and shake it – until one stick falls out. It’s like a game. Here’s another woman doing it. The number on the stick corresponds to a numbered sheet of paper on the wall, on which your fortune is printed. I shook, and out fell a stick with the number 9. Lucky number nine, that is. Yup, I hit the jackpot – because in Chinese astrology, and in Thailand, nine is an auspicious number. The number nine brings good fortune and progress. I’m not superstitious, but, what the heck, I’ll take it. I pulled my printed fortune off the wall. Do you want to know what it says? Okay, I’ll share – it’s pretty good. I think. I don’t know about a fish transforming into a dragon, but since I returned from Thailand, I’ve traveled to Florida and California (south and west from Connecticut), and my design business has been lively. “Good lucks approaching” sounds nice, but if there’s one thing I learned from Buddhism it is that you make your own good fortune. Thank you for your research and interest in Buddhism. May all living ones be happy. Thanks so much for sharing this part of your journey to Thailand with me. The photos as usual were exceptional, and the succinct mini Buddha lesson was completely satisfying. It must be nice to think about the monks praying for your peace.